Re-creating PenGwyn has stark imagery, intricate & unexpected choreography and a playful juxtaposition between the subtle & the extreme. 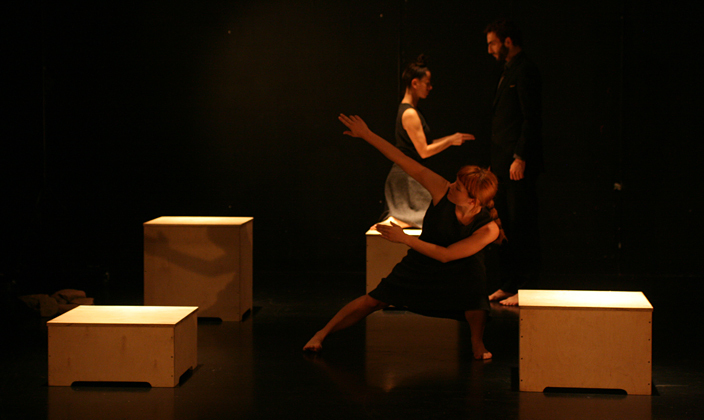 Exploring ideas of isolation & self, four mesmeric performers journey though a shifting landscape – sometimes a stage, or a zoo, a house, or the artic. Habitual patterns are exposed, magnified & presented as detailed human function; drawing the voyeurs’ attention to the subtle connections & extreme emotion beneath the contained framework of the choreography. Featuring four exceptional, diverse & internationally renowned dance artists, with ages from the mid twenties to mid forties. The collective company experience includes: Tanztheater Wuppertal Pina Bausch, Clod Ensemble, Protein, & Seke Chimutengwende amongst many others. Exquisite lighting and set design by Gerald Tyler.